The award-winning Michigan HIE attorneys at Reiter & Walsh ABC Law Centers have helped hundreds of children who have hypoxic ischemic-encephalopathy (HIE), cerebral palsy, and other birth injuries. Birth injury attorney Jesse Reiter, the firm’s president, has been helping birth injured children throughout the country for his entire legal career. Jesse focuses solely on birth injury cases, and most of his cases involve HIE and cerebral palsy. Jesse and his partner, Rebecca Walsh, are currently recognized as two of the best medical malpractice lawyers in America by U.S. News and World Report, which also recognized ABC Law Centers as one of the best medical malpractice law firms in the nation. The Reiter & Walsh, P.C. legal team has over 100 years of joint experience exclusively handling birth injury and hypoxic-ischemic encephalopathy cases. Our Michigan HIE attorneys work closely with our in-house registered nursing staff, medical experts, life-planning professionals and forensic specialists to give their clients the best possible birth injury legal help. Throughout this article, our Michigan HIE attorneys discuss causes of and treatments for hypoxic-ischemic encephalopathy, including a new treatment that has gained FDA approval for research. Hypoxic-ischemic encephalopathy (HIE) is a neonatal brain injury caused by a lack of oxygen-rich blood in the baby’s brain (birth asphyxia). Birth asphyxia occurs during or near the time of birth and is caused by oxygen-depriving conditions such as the umbilical cord being wrapped around the baby’s neck (nuchal cord) and placental abruption. If medical professionals promptly recognize the dangerous oxygen-depriving conditions that cause HIE and quickly deliver the baby, permanent injury can be avoided. However, the failure to prevent fetal oxygen deprivation and HIE can result in permanent, serious birth injuries. Some injuries and disabilities associated with hypoxic-ischemic encephalopathy include cerebral palsy, seizure disorders and epilepsy, cognitive impairments, developmental disabilities, learning disabilities and even death. Hypoxic ischemic encephalopathy (HIE) occurs when medical teams fail to promptly deliver oxygen-deprived babies. Many times, delayed delivery of an oxygen-deprived baby is the result of fetal heart monitoring errors. During labor and delivery, medical professionals are obligated to closely monitor the baby’s heart rate using a fetal heart monitor. The monitor provides continuous tracings of the baby’s heart rate in response to contractions. When a baby starts to experience oxygen deprivation, the heart tracings will become nonreassuring—nonreassuring fetal heart tones indicate a problem or abnormality with the baby’s health. Nonreassuring fetal heart tones often indicate fetal oxygen deprivation from fetal distress. Fetal distress is an obstetrical, labor and delivery complication that occurs when the fetus experiences oxygen deprivation. Fetal distress is signified by nonreassuring fetal heart tones on the fetal heart monitor. When fetal distress occurs, the medical team may give the mother oxygen or IV fluids or reposition her to try and decrease the fetal distress. However, while these actions are taking place, the medical team should prepare for an emergency C-section delivery. Minutes can mean the difference between the baby having no brain injury or having a serious brain injury, such as hypoxic-ischemic encephalopathy (HIE). During labor and delivery, medical professionals closely monitor the baby’s heart rate using a fetal heart monitor. Listed below are conditions, complications, and situations that can cause birth asphyxia and hypoxic-ischemic encephalopathy (HIE). The Michigan HIE attorneys at Reiter & Walsh have extensive knowledge of the following complications and birth injuries. We have handled birth injury and HIE cases involving each complication. Umbilical cord complications: Problems with the umbilical cord such as a nuchal cord (cord wrapped around baby’s neck), umbilical cord prolapse, short umbilical cord and cord in a true knot interfere with the passage of oxygen and blood to the baby, thereby causing HIE. Anesthesia mistakes, which can cause blood pressure problems in the mother, including a hypotensive crisis. This can greatly decrease the supply of oxygen-rich blood going to the baby, causing birth asphyxia. Placental insufficiency and intrauterine growth restriction (IUGR). Babies who have IUGR often don’t tolerate labor well. Delayed emergency C-section: Failure to quickly deliver a baby when fetal distress is evident on the fetal heart rate monitor is a common cause of hypoxic-ischemic encephalopathy. To read more about the cases our Michigan HIE attorneys have handled as they relate to these complications, visit our Verdicts and Settlements page here. Currently, there is only one treatment for HIE—hypothermia treatment. Hypothermia treatment is also known as brain cooling or body cooling. Hypothermia treatment must be given within six hours* of the time the baby experienced the oxygen-depriving insult. This usually means the baby must be treated within six hours of delivery. Research shows that hypothermia treatment halts almost every injurious process that starts to occur when the baby experiences the hypoxic-ischemic insult. Provided correctly and within the appropriate window of time, hypothermia treatment can prevent a baby with HIE from developing permanent brain damage. Unfortunately, some babies never receive hypothermia treatment because medical professionals fail to promptly diagnose HIE when it occurs. The failure to provide hypothermia treatment for a baby eligible for the treatment with HIE is an instance of medical malpractice. Currently, there are no medications that actually treat hypoxic-ischemic encephalopathy. Last month, however, the FDA granted orphan status for the development of cannabidiol to treat HIE. An orphan drug is a drug that is developed specifically to treat a rare medical condition. In animal research, cannabidiol was shown to have a protective effect on the brains of animals affected by HIE. Cannabidiol had no negative side-effects and provided cardiac, hemodynamic and ventilatory benefits. In short, in animals with hypoxic-ischemic encephalopathy, the medication reduced short-term brain damage and was associated with having beneficial effects on multiple body systems. Cannabidiol is a nonpsychoactive part of the cannabis plant that shows significant promise in treating a variety of neurological disorders. In addition to being researched as a treatment for HIE, the drug is being extensively researched for use in babies, children, and adults who have seizures. Research on animal models shows that cannabidiol can help prevent seizures. There are also significant signals from human studies on cannabidiol as a treatment for seizures; researchers are now focusing on double-blind, randomized, placebo-controlled trials for this seizure treatment in people. Hypoxic-ischemic encephalopathy is the most common cause of neonatal seizures. Seizures must be quickly diagnosed and treated because seizure activity can cause brain damage. Of course, underlying causes (e.g., hypoglycemia) of seizures must be treated, when possible. Antiepileptic drugs, such as phenobarbital, are frequently used to help treat a baby’s seizures. The medical team must make every effort to prevent a baby from experiencing oxygen deprivation during or near the time of birth. If a baby is diagnosed with hypoxic-ischemic encephalopathy, hypothermia treatment must be given within six hours of the initial insult. The medical team must make sure that a baby with HIE receives support to maximize oxygenation, ventilation and blood flow to the brain. Seizure activity should be promptly diagnosed and treated to prevent further brain damage. When a baby has hypoxic-ischemic encephalopathy, the brain injury evolves and it may cause permanent brain damage. Periventricular leukomalacia (PVL): HIE usually involves damage to the basal ganglia, cerebral cortex or watershed regions of the brain, but it sometimes includes PVL. Our Michigan HIE attorneys have helped children throughout the country with these injuries and disabilities. We give each child and family we represent close, personalized attention in order to obtain the most fitting resources for lifelong treatment, rehabilitation, and security. If you are seeking the help of a Michigan HIE attorney, it is very important to choose a lawyer and firm that focus solely on birth injury cases. Reiter & Walsh ABC Law Centers is a national birth injury law firm that has been helping children with birth injuries since 1997. Our legal team has over six decades of joint experience in the field of birth trauma law. 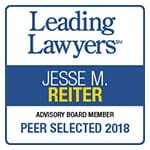 Michigan HIE attorney Jesse Reiter, president of ABC Law Centers, has been focusing solely on birth injury cases for his whole career, and most of his cases involve hypoxic-ischemic encephalopathy (HIE) and cerebral palsy. Partners Jesse Reiter and Rebecca Walsh are currently recognized as being two of the best medical malpractice lawyers in America by U.S. News and World Report, which also recognized ABC Law Centers as one of the best medical malpractice law firms in the nation. The lawyers at ABC Law Centers have won numerous awards for their advocacy of children and are members of the Birth Trauma Litigation Group (BTLG) and the Michigan Association for Justice (MAJ). If your child was diagnosed with a birth injury, such as cerebral palsy, a seizure disorder or hypoxic-ischemic encephalopathy (HIE), the award-winning birth injury lawyers at ABC Law Centers can help. We have helped children throughout the country obtain compensation for lifelong treatment, therapy, and a secure future, and we give personal attention to each child and family we represent. Our trusted birth injury firm has numerous multi-million dollar verdicts and settlements that attest to our success. No fees are ever paid to our firm ­until we win your case. Email or call Reiter & Walsh ABC Law Centers at 888-419-2229 for a free case evaluation. Our firm’s award-winning Michigan HIE attorneys are available 24 / 7 to speak with you.